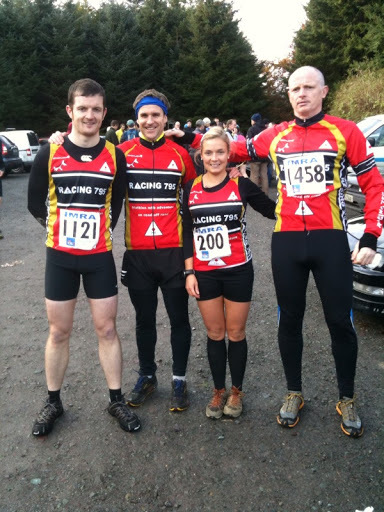 Saturday saw four 795ers make the club’s second outing into the world of Irish Mountain Running. Dena, Frank, Brian & John made the trip, with experienced mountain runner Bernard Fortune from SBR in the car too. Powerscourt Ridge is IMRA’s traditional end of season race and is about as tough as they come at this distance by all accounts. The route goes across 2 mountain tops (Maulin & Djouce), across the Valley at the river Dargle, back down by the Powerscourt Waterfall and takes in some of the most breathtaking scenery in Ireland (if you can actually find time to take it in). The race starts out at Crone Wood car park and heads off an uphill drag along well surfaced & nice wide forest roads lulling you into a false sense of security before turning straight up an old fire break that takes you up 200m of elevation within 800m, a 25% gradient! Welcome to the race . At the start I lined up directly behind Brian with Dena & Frank behind me. Brian made a great start and is an extremely powerful runner going uphill but I managed to keep within about 20 meters of him hitting the bottom of the fire break. Tactics coming into play I decided that I’d try a fast walk in an attempt to conserve a bit of energy. I managed to pass some people who were jogging and held the gap on Brian until about halfway up the climb when across a flat section he managed to open a bit of a gap on me. Going up the 2nd half of the climb I managed to maintain the distance to Brian, again using a mixture of run / walk in an attempt to make headway. Passing was difficult and going was very tough. After getting to the top of the climb and stuffing your lungs back into your chest the route takes in a fast sprint along a narrow laneway hugging the contour of the mountain before once more launching into another 25% gradient that finally sees the runner reach the top of Maulin – first mountain conquered, 3.1k into the race and over 410m elevation gained. Once I hit the laneway I immediately looked up for Brian but couldn’t see him. I set off at a fast pace trying to pass as many as I could before the next climb. The laneway was along a very narrow track and I was forced to run off track for most of it in order to pass runners in front. They obviously were saving themselves for what was coming and whilst I managed to stay ahead of most of them, one guy did take me going up through the heather. At times I was nearly on hands and knees trying to grasp stones and clumps of heather to pull myself along. At the summit of Maulin a brave group of supporters stood clapping us over the top and off down it again. So far the race has crossed well surfaced forest gravel roads, muddy & grassy firebreak, mucky slushy laneway, and a heather covered mountain side. Now the route heads straight down a wet rocky pathway that took us down a drop of 100m in elevation over the next 500m. I’m not a good climber, and am probably better at going downhill fairly fast. The race field ahead of me was pretty sparse at this stage and I threw myself down slope with purpose trying to make up as much time as I could before the next climb. Went flying past two mountain bikers who were having real trouble getting down across the stony surface – wusses Shortly after the MTB’ers I was maybe going a little too fast when I caught the toe of my right foot on a rock that sent me flying head over heels. Thankfully I managed to get my hands out to roll with the fall and rolled back onto my feet seemingly unscathed without losing too much momentum. I passed a few runners on this section of the downhill. A right turn took us across fairly level terrain as we ran around the side of the mountain ready to face the drop into the valley of the river Dargle. We were still only halfway down the mountain, and the steepest part was yet to come with another nerve-racking 25% gradient – only this time it was downhill!! Travelling across the side of the mountain I spotted a man with a camera (in the middle of nowhere). Naturally enough I give myself a quick once-over ready to show my good side, a quick look down and I see blood from my knee to my ankle, that fall must have taken more out of me than I expected. Past the lone camera man and time to throw myself down the steepest trickiest downhill I’ve come across. Luckily no falls on this one cos there’d be no stopping if you took off. I managed to pass another few runners on this downhill again. 4.8k to the river. Across the bridge at the river and now it was time to start the long climb up Djouce. One short sharp climb out from the river across a clay and stone pathway and then it settled into a long drag up to the shoulder of Djouce across grassy slopes. Almost immediately into the sharp climb and the most recent guy I passed out overtook me going up the hill, I was happy enough to let him go thinking if I could hang on I’d take him coming back down again. Then the girl that I had passed before him appeared on my shoulder and I struggled for a long while before eventually she went by as well. I really struggle going uphill and before we reached the shoulder of Djouce two more men had overtaken me. At this point the race turns right up the face of Djouce across really steep shaley ground that resulted in no-one passing anyone else out and lots more hands and feet type stuff scrambling up to the summit before swinging left at the top down across boggy ground and turning left again at the sleepers to take us around the side of the mountain before closing the loop back at the point where we originally turned right up the hill, and then heading back down the grassy slopes that we had come up. Chatting to Bernard in the car beforehand he said a good target would be to make it to this right turn before meeting the race leaders coming back down the hill – made it barely. 50m on the slope I looked over my shoulder to see the eventual winner of the race come striding around the side of the mountain looking very fresh. I meanwhile was anything but fresh and was in a world of pain at this point trying desperately to keep the lads behind me where they were. Numerous different body positions were used in an attempt to get up the mountain anyway I could; crazed Quasimodo type hunch back with arms swinging, hands on knees attempting to help push up the hill, hands and feet all 4’s scramble, stand up straight forcing the calves to do all the work, and on one occasion I even tried a little run At last the top and if only I had a second or two to spare the view was like standing on top of the world, looking down on everything all the way around. 7.8k to the top of Djouce, and over 400m of climb since the river. There was no time for looking around however, and it was straight into throwing myself down across the bog chasing the guy in front of me. The downhill didn’t come as easy this time and I had to struggle to pass him. The field was really widely spaced out at this stage and I nearly missed the left turn bringing us back across the side of Djouce. This section was fairly rough and I found it tough going. I was really starting to run out of steam at this stage and the only other person I passed on the way back down to the river was a guy who had sprained his ankle. I also fell a second time coming down this grassy slope, tiredness causing me to catch my toe on something only I wasn’t as quick to get up this time. The race now went back down to the river and climbed halfway up the real steep slope on the far side we came down earlier before turning right across some rough terrain before coming out at the top of the Powerscourt Waterfall and continuing down good roads again to the finish line. Umph – I hit the bridge like a sack of spuds, all energy left behind me somewhere on Djouce and this climb still to face. Needless to say a few passed me going up here. So Quasimodo like was my climbing at this stage that I never saw the guys in front of me take the right turn. When I did look up I could see no-one in front and my first reaction was that they had gone over the horizon so I redoubled my efforts before someone behind let a shout at me to come back. Thankfully had only gone 20m or so past it, but it was enough at that stage – I was shot. 12.1k in and I knew it was just over 3k of downhill from here but I just hadn’t the energy to attack it. I followed the two lads down past the waterfall before letting them pull away from me. On my own now all I could think of was the Snickers Duo I had waiting in the car for me as I plodded along trying to finish inside 1hr 45mins. About 600m from the end I could hear a runner catching me up from behind and managed to pick up a bit of speed for a short burst but he was too strong for me. Across the line in 1:42, I was happy enough with that and would have taken it beforehand, but should have been a few minutes faster on the day. 15.3k distance and a total of 973m ascent on the Garmin. Brian had a storming run to come home in 1:34 – really good running. Frank finished very strong right on my heels with a time of 1:43, and Dena was 8th lady home in a great time of 1:47. Bernard Fortune had travelled with us in the car and showed us what real mountain running looks like claiming 10th overall in a time of 1:24. Down to the pub afterwards where we got fed complimentary soup and sandwiches before a free raffle commenced wherein 4 of the 5 from our car all picked up prizes (yours truly being the only one not to win). At €7 for race entry this is surely the best value racing out there? All in all an absolutely fantastic race, I’m really looking forward to trying to improve that time next year and hopefully manage to stay on my feet while I’m at it. Judging by the reactions of the other 795ers I’d say they will all be looking forward to coming back too. We might even get a team together for the Wicklow Way relay race.